In today’s world, people have become more body conscious, putting more effort into overall health & fitness. Yes, it’s important to keep your fitness up but it’s also important to stay safe. People who love running know that the streets can be dangerous places to go out for a jog. It’s a lot safer to run on a treadmill in the gym and even in the comfort of your own home. Using treadmills to stay fit avoids accidents on the road with cars and keeps you safe from criminals. They’re also able to affect your heart rate by creating incline running, calculate how many miles you’ve run and the speed you’re running. Here we look at two of the best treadmills on the market at the moment. LifeSpan TR4000i vs. Sole F85 - How do they compare? Are you looking for an innovative machine capable of giving you the best value for your money? Both of these are impressive contenders. The LifeSpan brand started in 2001 and has been developing fitness solutions for home use & for gym companies for years. LifeSpan manufactures its treadmills with robust steel frames that come in folding or non-folding designs. The TR4000i is a midlevel folding machine with a durable all steel frame and integrated advanced technology to track your fitness progress. The TR4000i has an incredible heavy duty, high capacity 3.25 HP motor with a 20" x 60" walking belt surface. This brilliant design gives you up to 15 different incline levels, allowing you to adjust the intensity of your run. LifeSPan TR4000i allows you to kick your speed up to 12mph with a 15% incline allowing you to build up your overall speed and strength. The TR4000i can hold up to 350lb allowing those who struggle with weight to shed some pounds in a safe and secure environment. It has a stride area of 22" by 60" that has a combination of a sturdy 1” deck and 8 compression shocks. This reduces noise and protects your joints from the impact of running. This treadmill model comes with more than 50 workout programs that have integrated fitness regimes, tests and progress results. You can also customize these programs to suit your preference. The treadmill actually allows you to save your fitness data giving you the ability to sync your information with either Apple Health or Google Fit. The TR4000i has built-in Bluetooth speakers so you can listen to your favorite podcasts, E-books, and music while you run your miles. It also comes with a built-in USB port so you can charge your tablet or cell phone. This treadmill comes with a user-friendly 7” touchscreen which has an integrated color touch display. With a built-in Bluetooth heart rate receiver, you can push your workout regimen to the limits while still being able to track your heart rate. You can pair this feature with a Bluetooth armband or chest strap to give you accurate tracking rate every time. The LifeSPan TR4000i comes with a guaranteed lifetime warranty on the frame and motor & a five-year warranty on equipment parts. Not badly priced at all for all the features and durability you receive with this innovative machine. It comes in at a little over $1,699 currently. 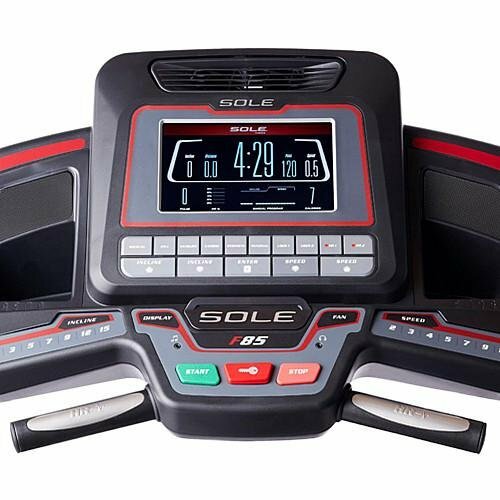 Sole has been the runner up in major fitness equipment for many years. 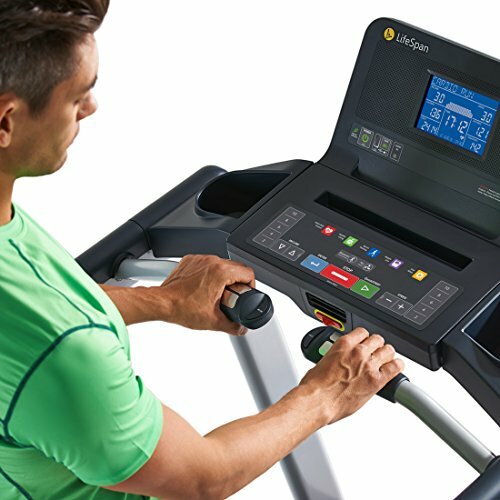 These treadmills are built with durable steel frames and built-in unique motor designs. This treadmill has been dubbed the best folding treadmill on the market at the moment. It comes with all the specs that a fitness fanatic would need in a treadmill. Let’s take a look at what this brand has to offer. The Sole F85 has a 4.0hp motor allowing you to go up to challenging speeds to keep up your stamina and fitness levels. 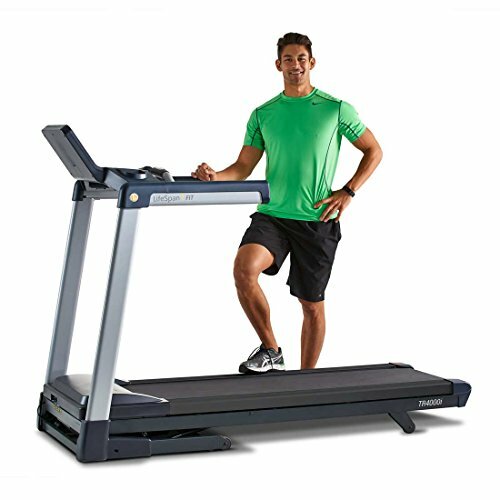 This treadmill can go to a minimum of 5mph and pushes to the maximum challenge of 12mph for the speed runners out there. It caters for an inclining rate of up to 15%. The F85 allows up to 400lb of weight, giving every one of all shapes and sizes the chance at a healthier fitter lifestyle. The Sole F85 has a running surface are of 22" X 60" with a two-ply track that has an integrated cushion deck shock absorption system. This assists with relieving pressure on your limbs when running. This treadmill comes with six standard workout modes with two customized programs and two heart rate programs. Sole F85 has a built-in sound display so you can listen to all of your favorite music while running. You can plug in an MP3 player as well as a pair of headphones. There’s also a built-in Bluetooth display allowing you to connect to all of your favorite apps. F85’s console has a 9" TFT blue backlit LCD display screen allowing you to see all of your tracking information such as heart rate monitoring, calorie count, and how many miles you’ve done for the day. Sole F85 has two heart programs for you to pick from. It also has a built-in pulse grip to monitor your heart rate more effectively. The treadmill is also compatible with heart rate chest straps. Sole has a lifetime warranty on the frame, motor and deck & a five-year warranty on electronics and parts. 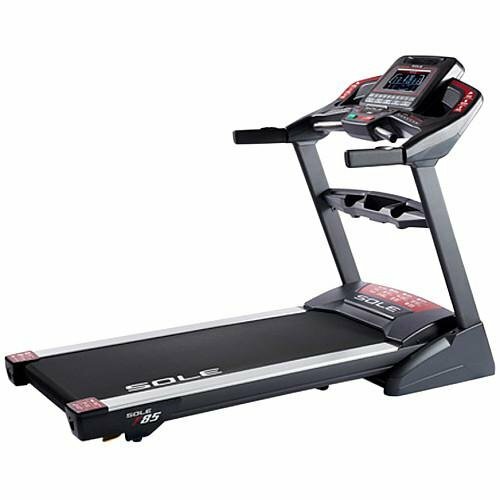 Known as the best on the market, you can purchase this brilliant treadmill for less than $2,000 currently. Whether you’re preparing for a marathon or you simply want to take care of your overall health, buying a treadmill is an excellent way to keep your fitness and stamina levels up. These two models are both impressive and the minor differences will guide you in what will really work for you. Are you serious about sticking to your running regimen come rain or shine? Take action today and treat yourself to a treadmill.